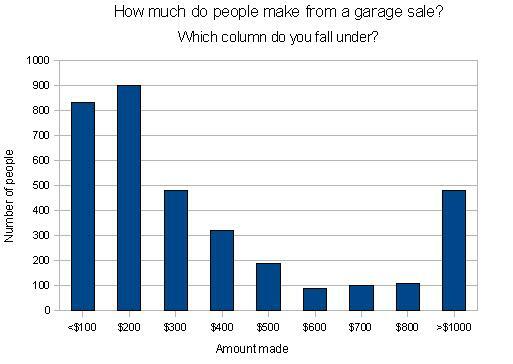 How much money can you make from a garage sale? Since 4.5 trillion users visit YardSaleSearch.com every month, and every one of them has garage sale juice running through their veins, we thought we'd see if they are the smartest people on earth or just weird packrats. How would we decide? Well, it all comes down to money, right? Not really, but we had to pick a metric for the purposes of this discussion. One simple question: how much money did you make from a yard sale that you had? Let's assume, for simplicity's sake, that you spend a whole day getting ready for the sale, and then a full day running the sale, cleaning up, burning the leftovers, etc. - that's about 16 hours total. If you make less than $100, that's less than $6/hr. If you make $200, that's $12/hr. If you make $1000, that's $60/hr. 1) Is it worth it? For even $6/hr? You could argue that that money is money you wouldn't have received otherwise. You could argue that there are intangible benefits: a cleaner house, socialization time with the neighbors, a chance for your kid to excercise their entrepreneurism by selling some of their stuff, etc. Can't put a price on that! 2) For those pulling in $1000 or more - why aren't you doing this more often?!?!?! We had one person who pulled in over $4000. To her, we ask: "what else is sitting around your house!" We don't think we own $4000 worth of stuff that people would buy! 3) What could they have done differently to bring in more? And, of course, for that we refer you to our garage sale tips section, the largest and most comprehensive (of course!) tips for holding a yard sale.